On open plains and under a pale blue sky, around mountains and rugged mesas, the many Apachean tribes roam far and wide over the north of the New World. Many tribes, such as the Navajo, Kiowa, and Jicarilla, are linked through common cultures and languages, but are fierce competitors for territory and resources, even amongst themselves.Most peoples of the Apachean tribes hunt bison on the plains and live in hide tents that are easily constructed and taken down, so they can follow the movements of the herds. Some tribes use dogs to haul their belongings and carry trade goods, which they exchange for goods such as corn.The Apachean warriors are brave, fearless, and highly skilled at warfare, whether using bows, spears, hatchets, or weapons taken from their enemies. Woe betides the enemy who angers the Apacheans enough to go on the warpath.The tribes have a deep spiritual connection with the land, passed down through stories of heroes and spirits. Spiritual dances are often practised to bring improvements to the lives of the tribes, such as rain and good harvests. 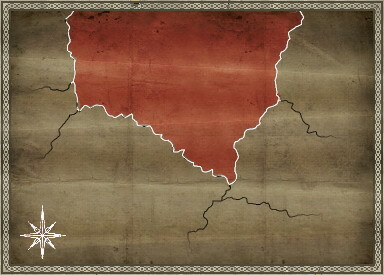 Although the tribes fight amongst themselves, they band together to fight off foreign invaders, including the Chichimecs to the south, and other nearby enemies. The Apachean tribes field many archers, who are also skilled in melee, despite having little or no armour. The Apacheans are also able to adapt their fighting style to use the weapons captured from their enemies. Skilled warriors armed with bow and hatchet and wearing wooden armour. Young warriors armed with a bow and knife, wearing no armour. Mounted Apachean troops riding captured horse, wielding bows and hatchets. Fierce, brave troops, with many skilled archers. Able to utilise their enemies' technology against them. Wear very little armour and wield mostly archaic weapons. The Hunters Tipi trains men to fight, increases food production and helps maintain law. The Farmers tipi allows for basic subsitance food production. The Raiders Tipi teaches the basics of warfare to young braves. This allows for more recruitment but also for more income from raiding. The Trader who occupies this Tipi brings in income to the tribe through his dealings. The Horse Trainers Tipi is residence for a brave who has learnt to ride horses and now teaches this to others. Allows Mounted units. The Gun Trader's Tipi allows for the dissemination of Firearms to a few tribesmen. The Armour Maker's Tipi allows armour upgrades for worthy warriors.